I hope everyone is having a great start to the weekend. I loved the opening ceremony for the Olympics last night. It is so amazing what they are able to do with the new technology,and it is the one time that I wished I had a large screen HDTV. But, as I am not a big TV watcher it isn't on my list of wants. I have been trying to fit in a little decorating this week while also trying to find some new streams of income. Something did pop up out of the blue a couple of days ago. I'll share that with you next week and let you know how it is going. You may have noticed that I also did a little redecorating on my blog. I wanted it to be lighter and simpler. I think I am happy with it (at least for awhile). What do you think? Now on to the wall update. 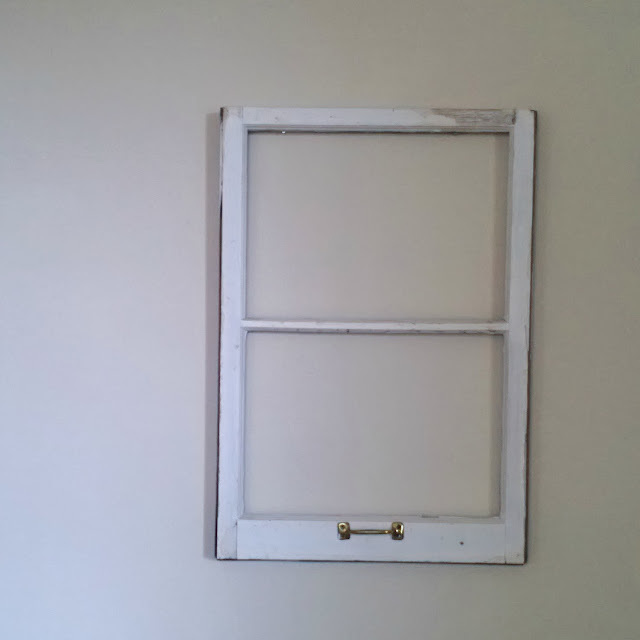 You may remember my old window frame from here. I hung it on the wall with a few embellishments. and to start adding some other things to the wall. I found the old window screen at a Habitat for Humanity shop when I was living in North Carolina. It was 50 cents. I loved that shop. The one we have here is just too expensive to find any real bargains. 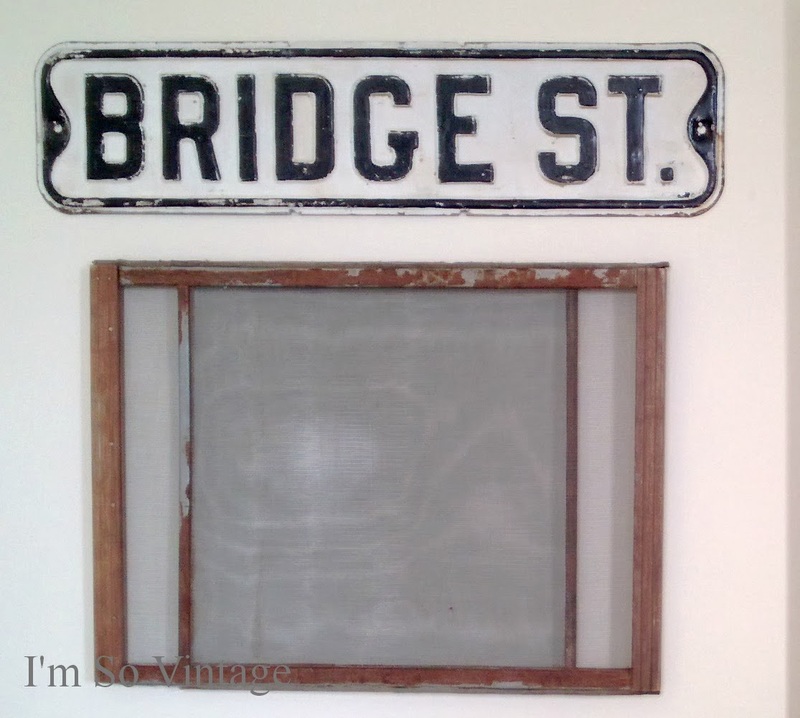 The Bridge St. sign is actually for sale in my shop. As a dealer, things are always being traded in and out of my house, so this will be replaced once I find a buyer. I'm sure I will probably add more at some point, but for now I am going to leave it like it is. I'll be watching the Olympics this afternoon while I work. Uh oh, I just heard a loud crash in the kitchen. SIGH!!!! Clean up on aisle one. I like your new look! I didn't get to see much of the opening ceremonies, my husband's a channel clicker :( Great wall decor! Oh how I love the collage. 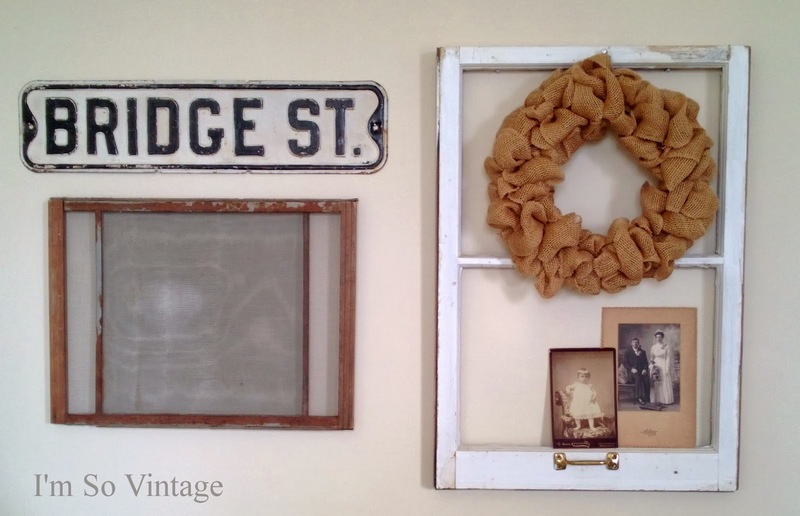 Nothing better to me than an old window, burlap and and old tin sign. I have been working on a book of my blogs so I haven't watched any of the Olympics and Winter is my favorite. Thank you. 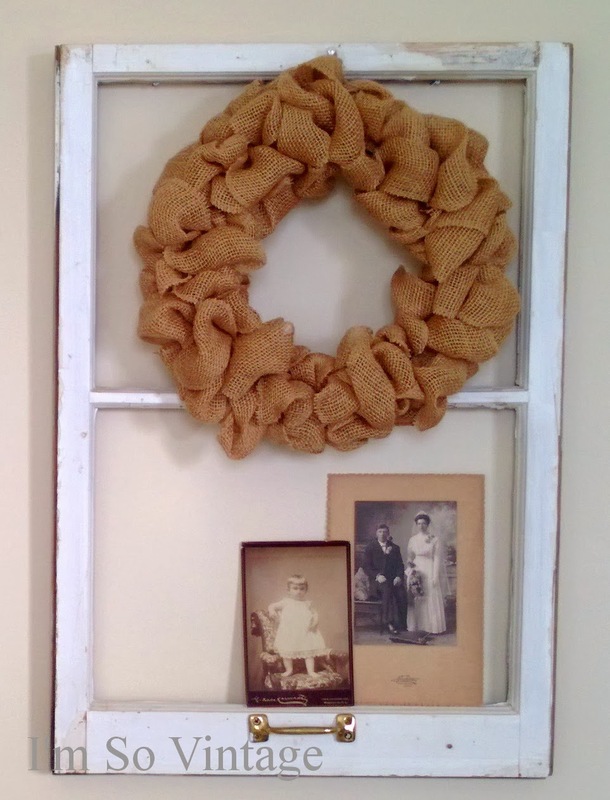 I am on the lookout for more old window frames. I love the new look to the wall. 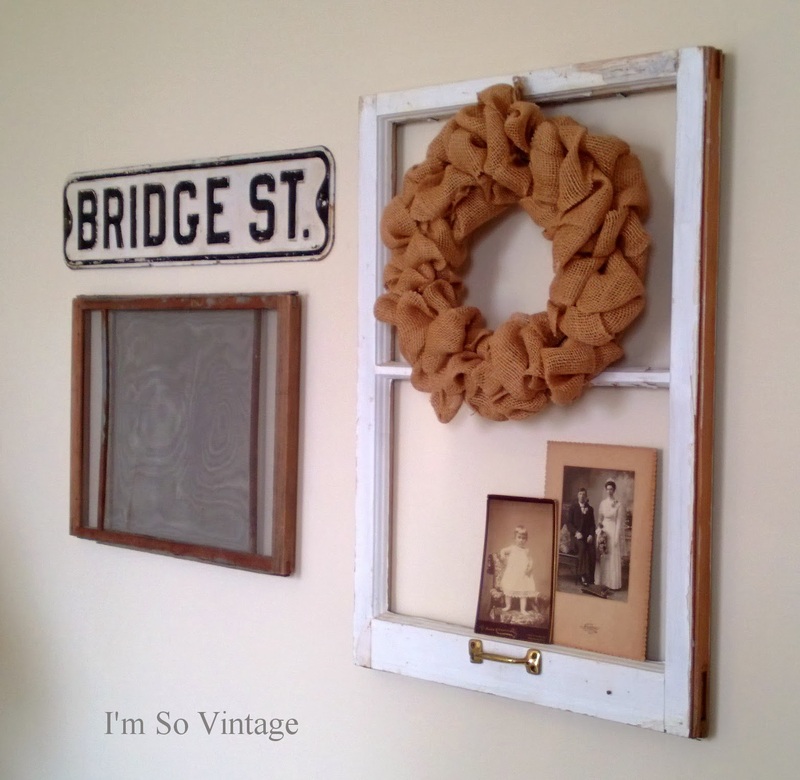 That window is so great and the bridge street sign love that. It all looks so great Laura. That's a pretty cool sign. I went to an auction just so I could get that sign. Oh my, what fell? Hope it survived. Like minds think alike, I adore decorating with screens and windows-looks perfect to me. I Tvod the Olympics Opening ceremony and watched it this morning. I too really enjoyed it, a favorite of mine was the gorgeous costumes of the Szar period in Russia. Have a good weekend. My sister dropped a large vintage Corning Ware vegetable dish. SIGH!! I did notice your new blog look the other day. I like the colours and the clean look to it. Your window and decor is really sweet and I love the Bridge St. sign. Have a good weekend Laura. Thanks Pamela. I wanted a simple brighter look for the blog. I thought the opening ceremonies was amazing as well. They definitely brought the best of talent and technology to the event. Always...the music of Tschaikovsky is mesmerizing. I love how your wall turned out! I have a feeling that the sign will not be around long! The music and the ballet were my favorites. A very nice wall arrangement! I like the street sign! I loved the Opening Ceremonies! In fact,that's what I blogged about today! But I super love your new wall arrangement -- it all looks great together! Wish we had a Habitat for Humanity resale shop here -- I would gladly shop at it! I didn't know they even had shops! Your new blog design looks great too! I love blue and birdies so, I am very much liking your header. 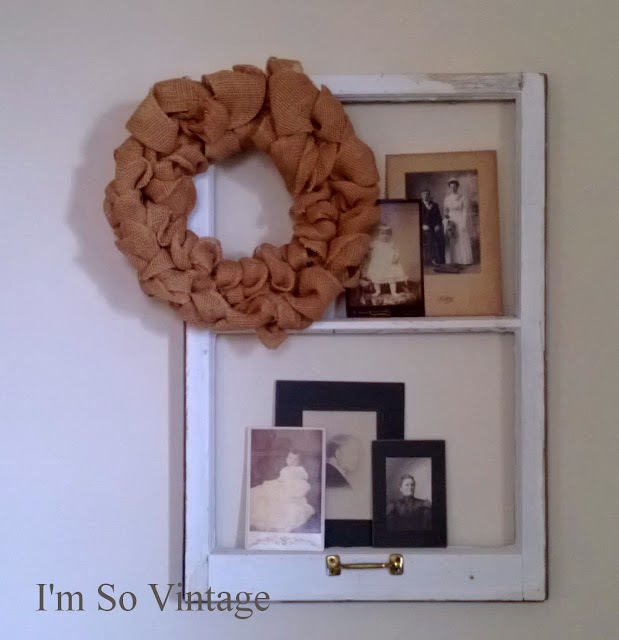 I like what you do with your vintage treasures. So nice and simplistic! I like blue and birdies, too. I was babysitting last night. I put the 3 year old in bed and told the three year old we would watch the Olympics. He covered his head and fell sound asleep. I liked it all except the history part. I never do like those. The little girl was up so high. What a brave one. I love the frame. I have something similar that I need to do something like that with it. Have you signed up for my giveaway. I actually liked the history part, even though I know that they idealized it. Your new header reminds me spring cleaning is just around the corner, Laura. Fresh and c;lean. What fell???? I love how you decorated that wall. Love the old window and the street sign.